Based on the contents of my past few CSA boxes, zucchini is doing really well this year. Or at least there's a lot of it growing. It's a veggie that you can easily add to just about anything, and that's pretty much what I've been doing with it. Grated, it makes a wonderful "raw" pasta substitute, I love it lightly stir-fried with other veggies, it's delicious sauteed and added to salads, omelets, or whatever else is cooking, and then of course there's always zucchini bread. My grandmother used to make it every summer. She would bake it in loaves, and then sandwich softened cream cheese between thin slices. It tasted like cake, and I suppose it practically was the way she made it. YUM. I started looking online for gluten free zucchini bread recipes, and I came across some zucchini mini muffins with chocolate chips over on Elana's Pantry. I love that website, and I have her Gluten Free Almond Flour cookbook, which I use regularly. 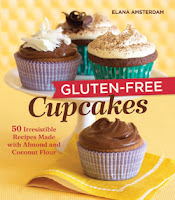 She now also has a Gluten-Free Cupcakes book, which is now on my wish list, if anyone is feeling generous. But I digress. Here is the Gluten Free Zucchini Chocolate Chip Mini Muffins recipe, and the only things I changed were my typical substitutions of using coconut oil for the grapeseed oil and maple syrup for the agave nectar. Oh, and I doubled the recipe because these muffins haven't been lasting any time around our house. Combine coconut flour, salt, baking soda and cinnamon. Set aside. Combine eggs, oil, agave and zucchini. This bowl was plenty big enough the last few times I made this recipe, but I neglected to consider that this is a double recipe, and therefore required twice the space. I needed a bigger bowl. Thoroughly mix the dry ingredients into the wet ingredients. Then stir in the chocolate chips. The recipe says to grease and flour the muffin tin, but I just used nonstick cooking spray. The first time I made this recipe, I lined the cavities with mini muffin cups, but the batter (and chocolate chips) then stuck to the paper, so this is one of those recipes that works better in a naked pan. For mini muffins, spoon a tablespoon of batter into each cavity. I thought I'd have enough batter to make 12 standard size muffins as well since I doubled the recipe, but I only got seven. Bake at 350° for 18-22 minutes. Some recipes work best if you make them as intended, and I think this one might fall into that category because the standard size muffins didn't come out as well, quite literally. Once the muffins have cooled a few minutes, run a knife along the sides, and the minis pop right out. A few of the bigger ones weren't so cooperative. But they still taste delicious! Do you have a favorite zucchini bread recipe? If so, leave a comment letting me know, and I might just try it--or attempt to make a gluten-free version of it.